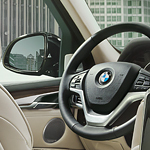 The BMW X5 is one of the most popular vehicles in its class, and you may be able to find it at BMW of Watertown. One reason why you will like this vehicle is that it comes equipped with 22-inch wheels. This allows you to ride higher and have a greater field of vision compared to everyone else on the road. Being able to see over other drivers gives you a better chance of avoiding collisions with people or objects. Information such as directions, your current speed and more can be displayed on the car's windshield. This allows you to stay informed without having to take your eyes off of the road. Keeping your focus on the road further reduces the chances that you are in an accident. Having access to information in one spot also keeps you abreast of any issues the vehicle may have as they occur.